The last time I shared a Jane update was at 6-months, and it’s amazing how much can change in such a short period of time. Jane turned one a little over two weeks ago and it feels like the perfect time to share another big update, mostly because I love having these posts for myself to look back on and see what she was like, and because I always find it so interesting to hear what other kids and moms are going through at different ages. For starters, I can’t believe she’s actually one. This was simultaneously the absolute longest year of my life, and the fastest that time has ever passed; the first year of parenthood is a full-fledged time warp. At Jane’s birthday party a few of my girlfriends gave Mike and I presents (wine) to celebrate surviving the first year. It was the nicest acknowledgement because ohmygod some days it feels like will we actually survive? Now that she’s officially in toddler mode, I feel like we have our footing and are, in fact, surviving. Yet, everyday is a totally new ballgame with her. Infant life was all about nighttime exhaustion, the “will she sleep?” gamble every single evening as the sun sets. Toddler life is much more about daytime exhaustion; constantly running after her and saying on repeat: “Don’t touch that! Don’t put that in your mouth! That’s a no-no!” I joke, but it’s actually so much fun at this age to see her mind moving at lightening speeds as she’s figuring things out. She is curious, inquisitive, and sometimes quite nosy (she desperately tries to insert herself in conversations with strangers at restaurants and grocery stores). She is so close to walking and holds our hands as we do laps around the downstairs of our house. She crawls at a rapid fire pace that I sometimes can barely keep up with. She is starting to talk and has a small arsenal of words she repeats like: Cat, Up, Ma, Dad, Hot! and Uh-oh! My favorite are her “party tricks” as I like to call them; if you ask her what a dinosaur says she respond “Rawrrr! !” and a monkey says “Ha!Ha!Ha!” and a dog noise is her sticking out her tongue and panting like an actual dog. If you ask her to do “cheers” she clinks your glass with her sippy cup (proud mom, she’s already the life of the party). Speaking of sippy cups, Jane’s current claim to fame is her ability to eat and drink a quantity of food and milk that boggles our minds. Where does she put it all? We said goodbye to bottles right after her one-year doctor’s appointment and it was a surprisingly easy transition. After just one day of swapping them out for sippy cups she was pretty much indifferent to them being gone – a huge relief! She will eat anything and everything, but she especially loves eating eggs for breakfast, cinnamon raisin bagels day or night, she consumes enough milk and cheese to single-handedly support our local dairy farm, and she has a taste for salty foods like olives and pickles (an odd choice at 12 months). Usually what she loves to eat the most is whatever is on mom and dad’s plates. Outside of her constant interest in eating, her next favorite thing would probably be her books. 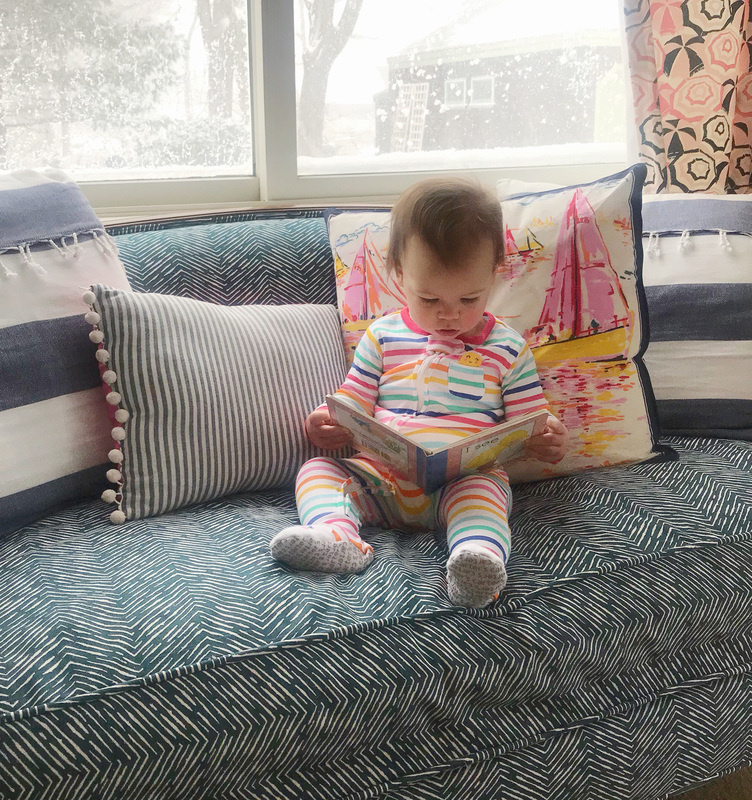 I’m bursting with joy that she loves looking at books; it makes me so happy to see her sit and flip through them and study pictures and offer them up to us to read with her. We got to the library several times a week and it’s her favorite place. A few of our favorite books are the Stanley the Hamster books, anything and everything with dinosaurs in it, like Dinosaur Dance and Never Touch a Dinosaur (she is obsessed with dinosaurs, it was her first birthday party theme! ), and she has been reading The Fish With The Deep Sea Smile every night before bed recently. She also started swim lessons and loves playing in the pool with her dad (and I love her adorable ruffled bathing suits), and her favorite toys are the Fisher Price Little People (she loves the treehouse with the puppy the best!). We’re at that lovely stage of infancy where we’re able to start putting away more and more of the baby gear, and replacing just a few items with the toddler-versions. My friends at Chicco just sent us a “big-girl” car seat and it has been a game changer. 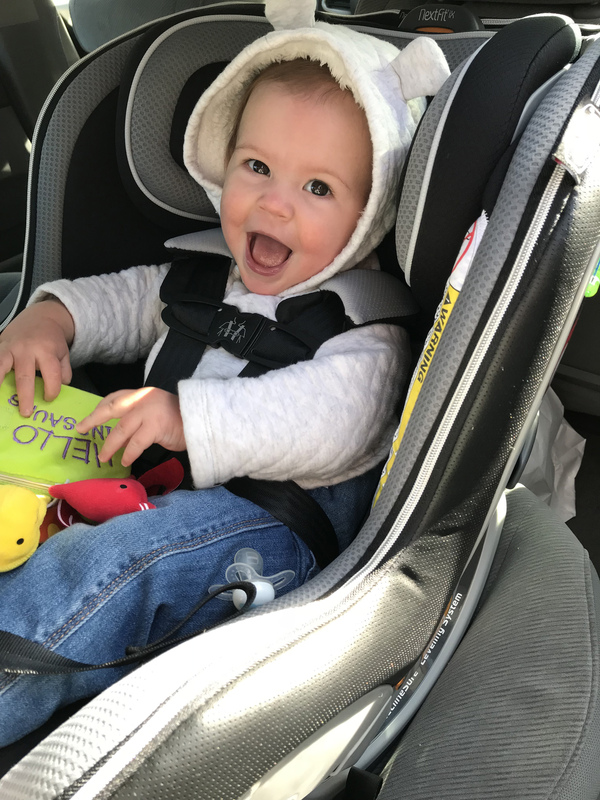 Jane was furious being squished into her infant car seat, and is now riding in much more comfort and style in the new NextFit® iX Zip convertible car seat (I’m a huge fan because the whole interior zips off and can be washed!). We are also trying out their Viaro Stroller and I love how much smaller it is than our old stroller. It takes up about half of the room in our tiny trunk, but still has all of the features we loved in the old model (lots of cup holders, a big storage basket, and folds up easily!). Now we just need it to be warm out so we can start talking our daily walks down to the harbor again! 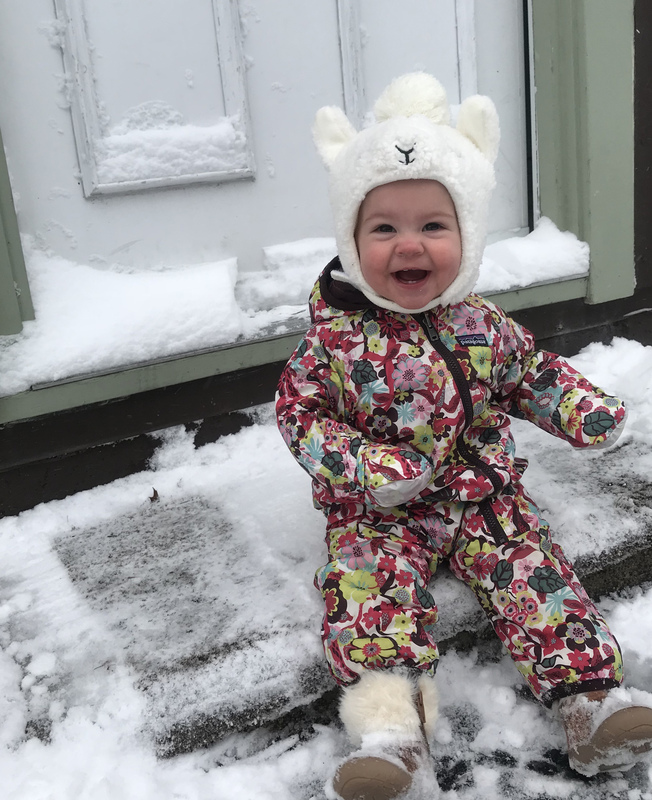 Until it finally warms up, one of my favorite baby products this winter has been Jane’s Widgeon Fleece winter coat. My mom gave it to her for Christmas and swore they were the best baby coats, she bought them for my siblings and me when we little. It is so easy to get on, closes up with just one little stick of Velcro on Jane’s shoulder, and she looks SO cute in the little gnome-esque hood. Our other favorite addition to Jane’s wardrobe has been her Stride Rite soft motion sneakers. I was so sad to pack up her Freshly Picked moccasins, but now that she’s close to walking she needed a lot more support for her little feet. These shoes are easy to get on, stay on, and seem to have given her so much more stability as she toddles around our house. Oh, and Jane’s OshKosh overalls are our absolute favorite clothing item, my dad actually picked them out for her for Christmas! They make my heart melt because she looks like such a big kid wearing them. Most of my giant baby registry review I shared when Jane was six-months old still rings true; the one item we are still getting so much use out of that I raved about in that post was our OXO high chair, it’s still one of the best baby gear purchases we’ve made! As I finish up this post, Jane is taking a nap in her crib, which is proof that every single day with her is something new. She has been rejecting naps for two weeks, and usually will only take one if she’s lounging on the couch in our living room. But today she decided a crib-nap was on the agenda, and I’m so very grateful for her rest, the quiet, and whatever new tricks tomorrow will bring! Please note: Chicco has gifted me products for review in this post, all opinions, images, and content are my own. One-Pan Roasted Shrimp and Vegetables. Brownies With Salted Nutella and Cream Cheese Drizzle. 2 Responses to "Jane’s One-Year Update." Aw I love that! How fun.